Samantha Mesrobian, centre, picks up her 2017 Chevrolet Bolt EV on Feb. 2, 2017 at City Chevrolet in Toronto, Ont..
Chevrolet Bolt EVs have started arriving in Canada, two years after its concept debut. Some of the first rolled off auto haulers at dealerships in Quebec and Ontario, two of three provinces that offer substantial provincial rebates on electric vehicles. Bolt EVs are also in transit to Bolt EV-certified dealerships in British Columbia, which also offers incentives to EV buyers. “This is a truly satisfying moment as our customers begin to experience this ground-breaking technology and overall fun-to-drive vehicle,” Laura Pacey, brand director for Chevrolet in Canada, said in a statement. 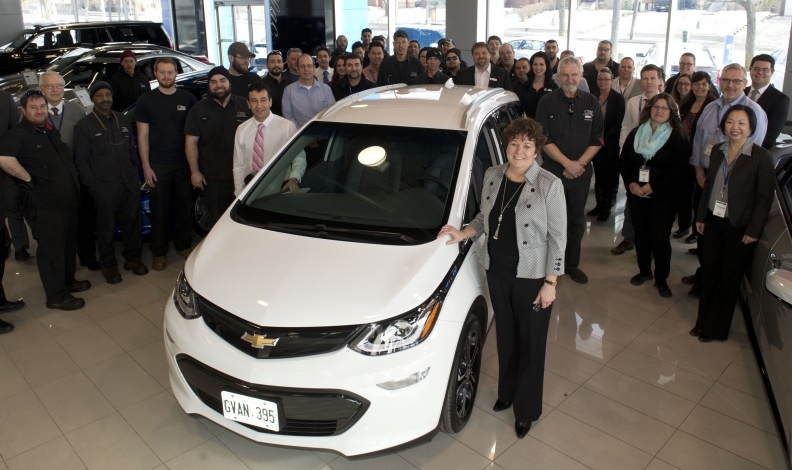 Amongst the first Canadian customers to receive the highly anticipated Bolt EV is Samantha Mesrobian, who bought her Bolt EV at City Chevrolet in Toronto. The director of corporate social responsibility at Scotiabank said she replaced Land Rover with the Bolt EV. “It is the perfect car based on my current driving habits, and has a long range battery. There is no impact to my lifestyle other than reducing my carbon footprint. And that's what my goal was,” she said in a statement. Named the 2017 North American Car of the Year, the Bolt EV offers an U.S. EPA-estimated 383 kilometres of range on a full charge, enabling owners to go beyond average daily driving needs with range to spare. Claude Michaud, past President of Quebec-based RenoDepot, previously owned a first-generation Chevrolet Volt. He purchased his Bolt EV at one of Canada’s top-selling EV dealer, Bourgeois Chevrolet in Rawdon, Que. The Bolt EV starts at $44,395, freight included. Pricing can be lower in Ontario, Quebec and B.C. after varying provincial incentives are deducted.